College football is a loud sport and in a game as verbally-dependent as football if a visiting team can’t relay their plays effectively or make last minute adjustments, it can be huge advantage for a home team. So it is no surprise that Penn State has not only done scientific research to determine the veracity, direction and variability of you and your hammered dorm friends screaming obscenities at the opposing quarterback and his dumb face… they plan to make it louder. Next season, the university’s athletic department will put into play a new strategy to make its field even louder thanks to a team of acoustic scientists. The goal is to send a deafening wall of sound at the opposing team’s offensive line. “We’re not going to let visiting teams get comfortable, and if you can’t get comfortable, you’re probably not going to perform as well,” said Guido D’Elia, director for communications and branding for Penn State football. 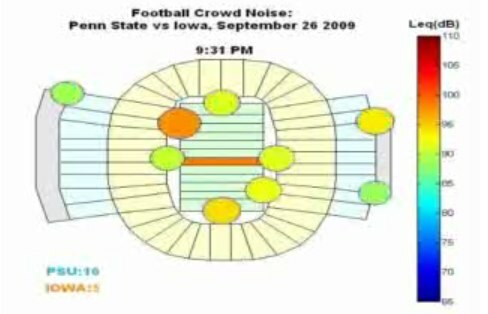 Working with D’Elia in 2007-08, Penn State graduate student Andrew Barnard recorded crowd noise during three home games. Using 11 sound meters strategically placed around the field, he compared volume levels when each team had the ball. When the Penn State’s Nittany Lions were on the offense the noise levels inside 107,282-seat Beaver Stadium reached 75 decibels on the field. That’s about as loud as a car radio playing at a reasonable volume. But the noise skyrocketed to 110 decibels — 50 times as loud — when visiting teams were on offense, drowning out the calls of the quarterback and making last-minute adjustments at the line of scrimmage very difficult. We are guessing the exact strategy for amplifying the sound in the direction of the quarterback and offensive line is something they are going to keep close to the vest. However, if an Ohio State left guard passes out on the field whilst blood spills from his ears, you’ll know it’s working.